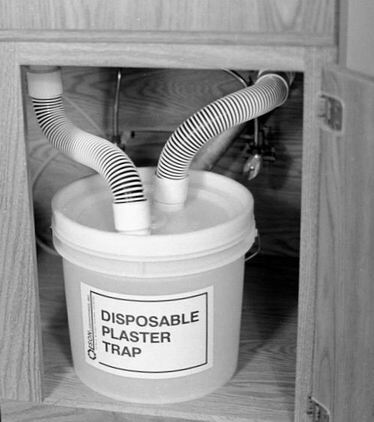 The Disposable Plaster Trap is a convenient and sanitary means of reducing residue and sediment from plaster slurry water discharge. The Trap acts as a sediment tank that permits plaster residue to collect therein. When full, the disposable container is replaced with a new container. Hoses plug into and out of successive containers for swift and easy maintenance. Provided snap-caps fit onto the spout openings of the used container enclosing the contents and allowing for convenient disposal. Choose your destination from the list to the left. Page designed and created by Eric Olsson. Send comments to webmaster. Last updated 12-May-2011.